In the District of Ghotki Sindh there is a tiny village called Raharki Sahib which is known for a great Saint of Sind The purity of his character and true love in his heart attracted people towards him. 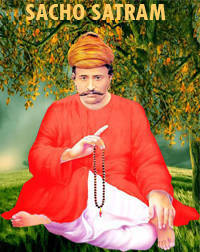 Saint Satram Das Sahib was a seeker of truth. The birth of this Great Saint at Raharki Sahib has made this tiny village a holy place a place of worship where people from all walks of life from all around the world come and get their wishes fulfilled, who ever comes here does not go empty handed. Anybody who comes here with tears in his/her eyes goes back happily and contended. 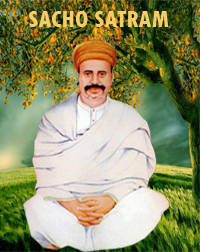 Saint Satram Das Sahib was a Guru and spiritual guide to Saint Kanwar Ram Sahib. 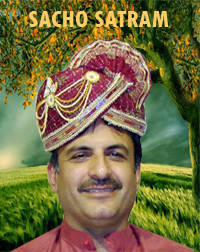 He was an ocean of spirituality and a great spiritual leader. Saint Satram Das Sahib received the pious Naam Daan from his Father Saint Khottaram Sahib, who was a highly self released soul, divinely intoxicated man. 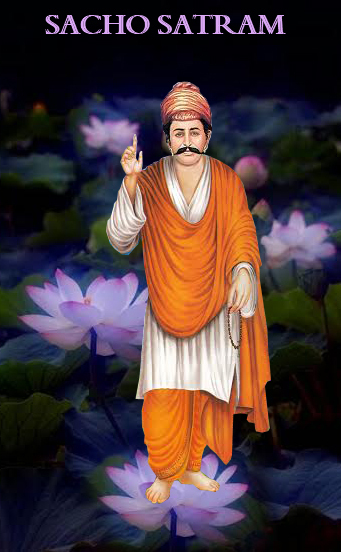 Saint Khottaram Sahib had three sons Bhai Sahajram, Bhai Sabhagchand and the youngest was Saint Satram Das Sahib. With the grace and love from Sai Khottaram Saheb, Sai Satram Das Sahib received spiritual wisdom. It is not that the age of a person is important to receive the grace of his Guruji but what is important is the purity of his soul. When Saint Satram Das Sahib was born, he did not take his mother’s milk as he was a yogi in his previous birth and was never interested in any materialistic things. He was away from such wants and desires. At the time of his birth his father Sai Khottaram Sahib was in deep meditation and every one was upset because the child was not accepting his mother’s milk. Two days passed but the child even after not accepting milk was calm, smiling and and his forehead was illuminating with the divine light. On the third day after meditation, Sai Khotram Sahib came to know that his son had not accepted milk and water. Saint Khottaram Sahib knew the spiritual qualities in his son so he in his ears whispered precious NAAM Mantra and asked him to accept his mother’s milk and promised him that he will get moksha, Mukti and liberation from the cycle of birth and death in this birth. And after accepting the pious Naam Mantra from his father, Saint Satram Das Sahib accepted his mother’s milk.